An artful take on a pragmatic complication. Characterised by the airy and distinctive custom typeface by graphic designer Philippe Apeloig, the Slim d’Hermès line has come to include a perpetual calendar and an “impatient hour” complication since its introduction in 2015. 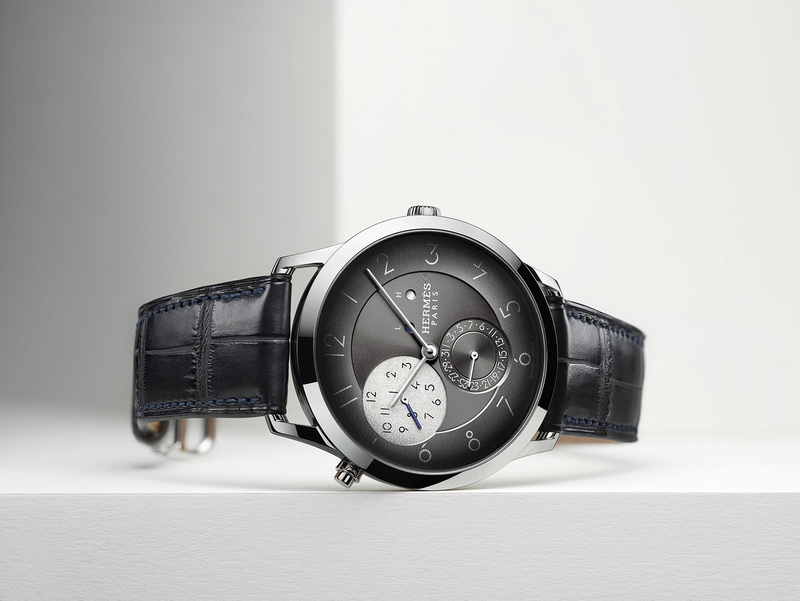 And now, the brand has unveiled the Slim d’Hermès GMT – an idiosyncratic, yet simple and practical dual-time watch. A limited edition of 90 pieces, the Slim d’Hermès GMT has a palladium case with trim proportions – 39mm in diameter and 9.4mm in height. As with most things Hermès designs, it is studiedly offbeat and refined. 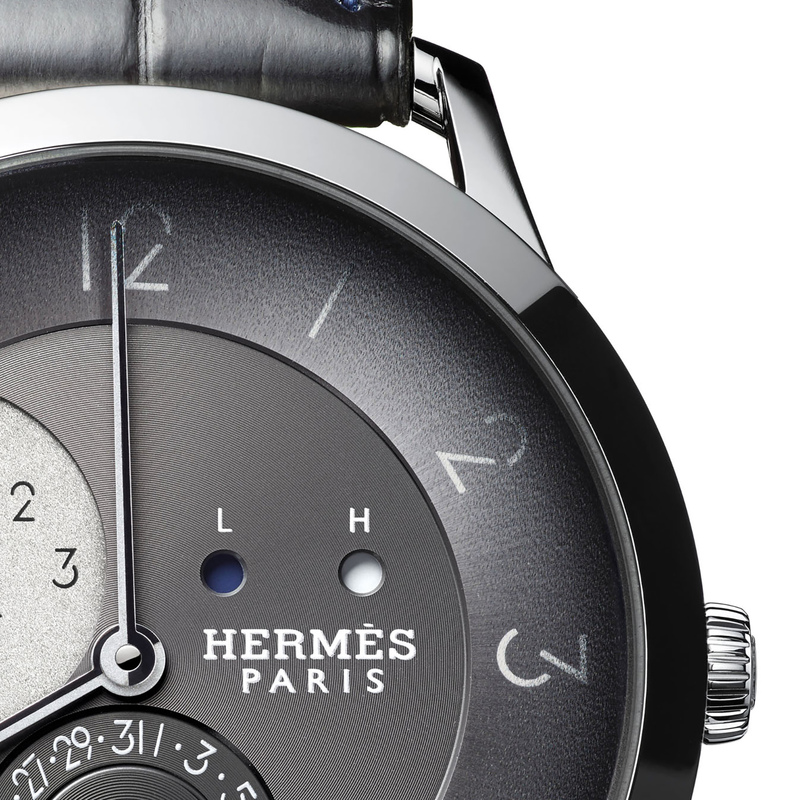 It has a slate grey dial with a sunburst chapter ring under a smoked sapphire crystal. The home time zone is displayed in a silvered subdial at ten o’clock, which is just a tad bigger than the date counter at six o’clock, and is adjusted via the pusher beside it. The numerals are seemingly scattered across the sub-dial, but are still arranged chronologically, with time indicated by a blue lacquered hand. As it is a 12-hour display, the second time zone is accompanied by a pair of day-and-night indicators at two o’clock, labelled “L” for local time and “H” for home time, showing white for day and blue for night. 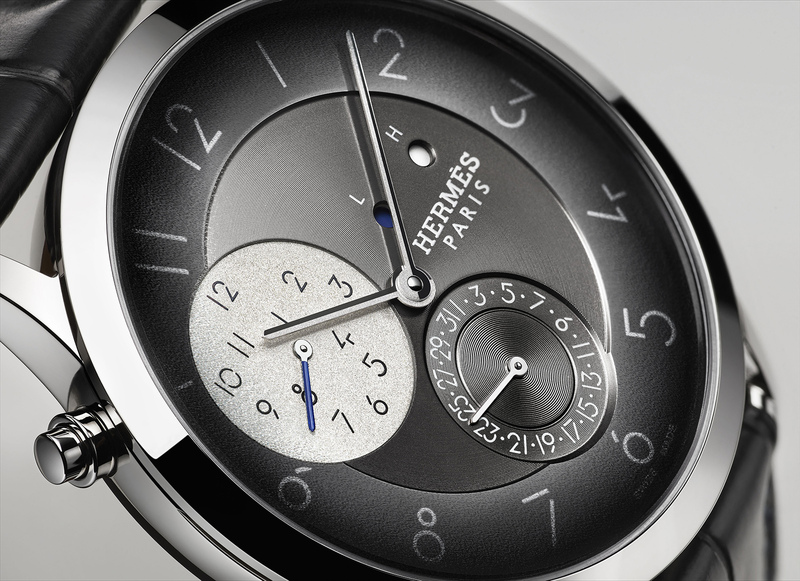 The watch is powered by the compact automatic H1950 from movement maker Vaucher (of which Hermès owns 25%), with the ultra-thin GMT module developed by long-time partner Agenhor, a complications specialist in Geneva. The movement measures 4mm in all, which allows the case to keep to its relatively trim proportions. 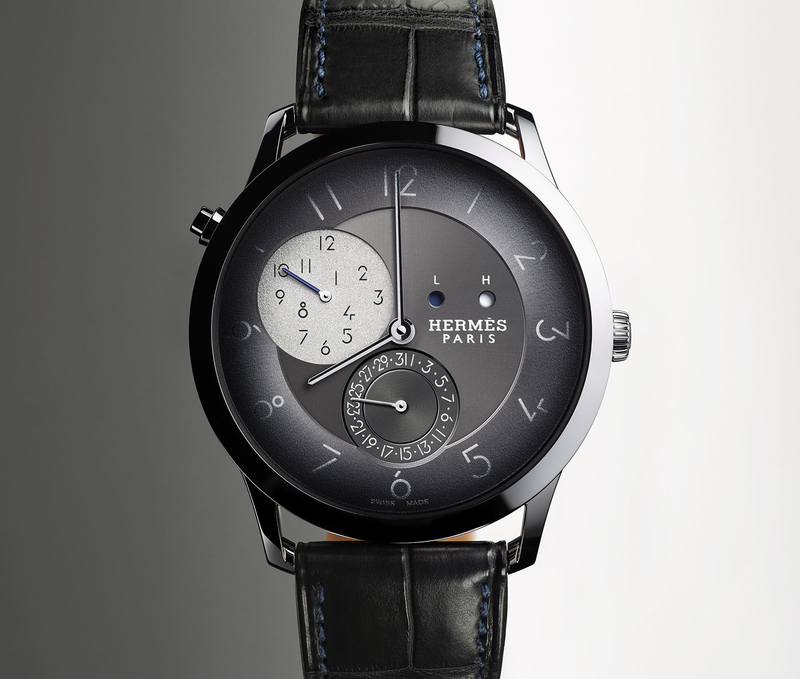 The Slim d’Hermès GMT is a limited edition of 90 pieces and is priced at US$14,700, or SFr13,200. The perpetual with second time zone now in platinum and metallic blue. Equipped with a countdown function that ends with a single chime.